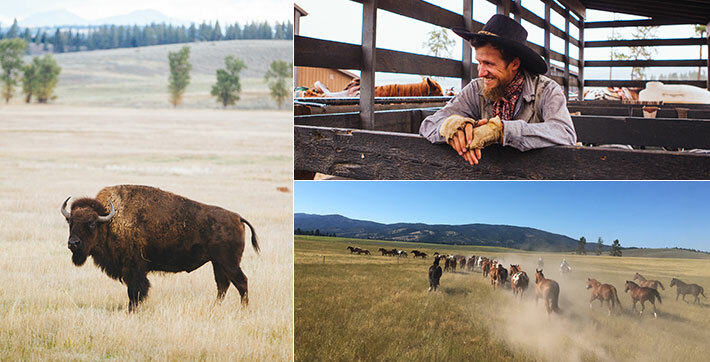 Located 35 miles from Missoula, Montana, The Resort at Paws Up provides a unique get-away for busy lifestyles. Paws Up is on a 37,000 ± acre ranch that is filled with activities ranging from riding in a chuck wagon, to experiencing fly fishing on the Blackfoot River. The resort offers a luxury home stay or safari-style tent, both offering five-star amenities and personalized services. In addition to its busy summer season, Paws Up also has a winter option for guests. In the winter, there are activities like snowmobiling, skiing, and one-of-a-kind things to do like dogsledding. Not only is this resort a blast with these specific activities; but, it also gives guests the ability to: cross country ski, ice skate, go snow tubing, go snowshoeing, archery, use a fitness center, access trails, go geocaching, mountain bike, hiking, pony rides, and much, much more. Paws Up is family-friendly and offers event services for family reunions, weddings, and anniversary/birthday packages. The resort also has ‘kid adventures’ that are supervised and have organized activities for children. These activities range from horseback riding to nature education. Paws Up offers a luxury experience through their luxury home lodging, luxury camping, and their island lodge. The potential for an exceptional experience is guaranteed! This program truly gives visitors a Montana experience that they will value forever. Montana is, after all, the last best place.